If you are considering the next level of protection for your expensive cargo that is delicate or fragile, consider air ride suspension shipping. Although the term air ride suspension may sound complicated, it merely means more efficient shock absorbing systems. The use of this type of suspension is standard for delicate equipment that requires a stringently stable transportation mode. Any suspension is not foolproof in ensuring that your valuable equipment, excavators, and dozers get to their destinations intact, but air ride suspension will offer you some significant benefits. The air ride suspension system trades the traditional steel leaf springs for a bag or bladder of compressed air that acts to absorb road vibrations and bumps. By doing so with extreme efficiency, the delicate cargo onboard is better protected from vibrations and bumps on the road as a result of the higher ratio of shock absorbency. Primarily you can compare the trailers freight to gliding on a cushion of air. Trucking equipment fitted with air ride suspension protects sensitive cargo from the effects of uneven road surfaces by absorbing the added stress. The suspension system eliminates damages associated with telescoping and compression mostly observed in the steel-leaf-spring suspension systems. 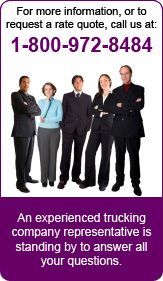 They can as well prevent damages to cargo or equipment, while also avoiding injury-causing accidents to personnel. Always verify that the shipping operator has the intention to engage air ride suspension both on the tractor and the trailer. One without the other will result in little to no difference to the shock absorbing benefit afforded by the suspension system. 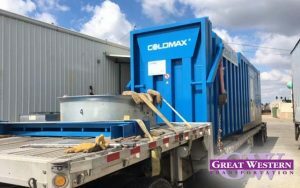 After identifying the most efficient suspension system, it’s vital that you use a shipping firm that has a good reputation for operating well-maintained equipment. Reputable firms have a professional crew that diligently load your freight and transport the fragile equipment safely to its destination.